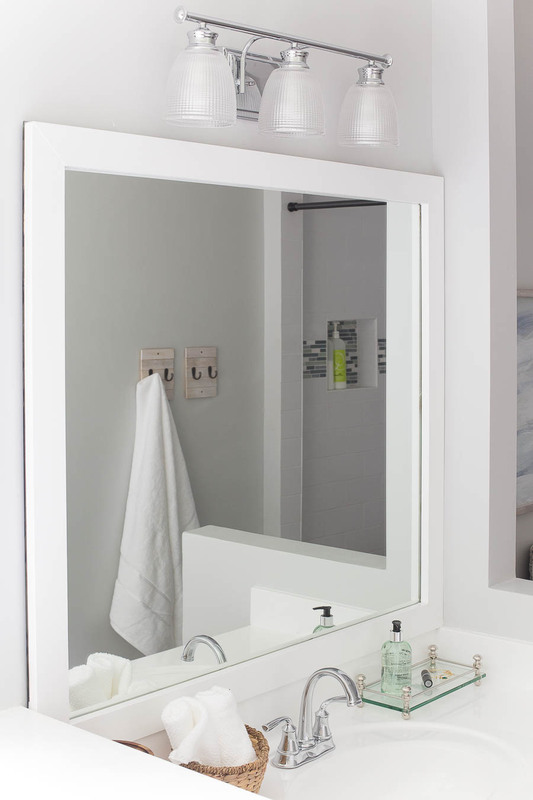 You know those builder grade, jumbo sized bathroom mirrors that aren’t exactly high style design, can be fashioned to your taste with a quick modification. When updating a bathroom, one slice of the budget usually goes to a bathroom mirror. Even the budget mirrors at Home Goods can run between $50-$60 for a small-ish mirror. 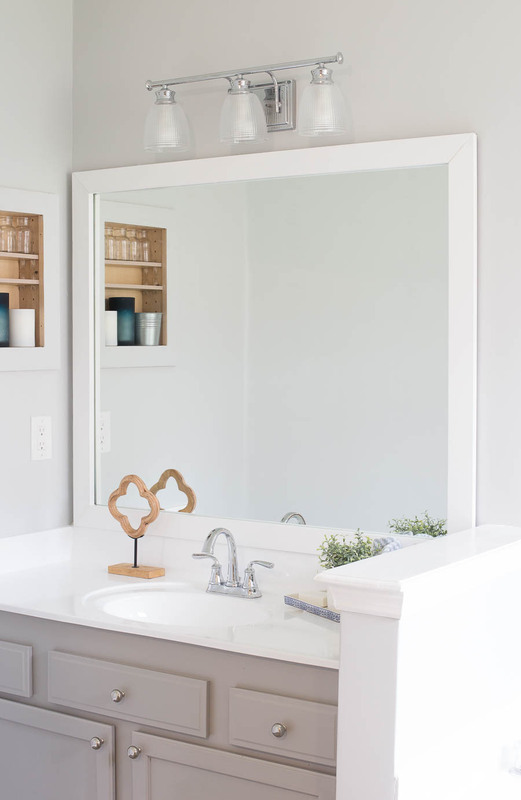 For our latest bathroom renovation, instead of replacing the bathroom mirrors – we updated them. (PS. 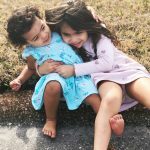 If you didn’t catch the big ol’ bathroom reveal, head over here first and check out the ahhhh-mazing before and after.) 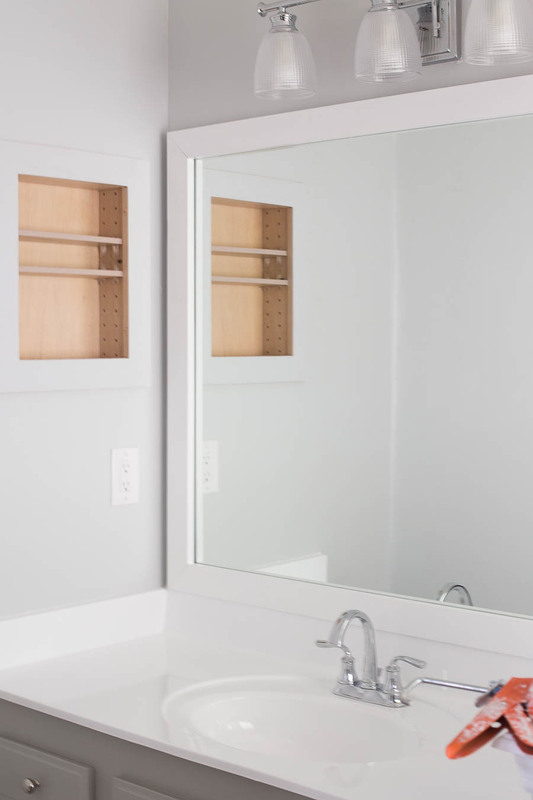 We framed vanity mirrors for less than $40 in wood. So, for the price of one small sized hanging mirror, we framed out two huge bathroom mirrors, in an afternoon. Let me show you how! Our bathroom has two separate vanities with huge builder grade mirrors. After we painted the vanities and re-glazed the countertops it was clear that we needed to do something to upgrade the mirrors. I actually loved the size of the mirrors, they are proportional to the vanities but buying a replacement of this size would have been pretty pricey. Since our bathroom makeover was pretty budget friendly, we decided to frame the vanity mirrors. Matt and I knocked out this project in an afternoon and they really came out pretty professional looking. 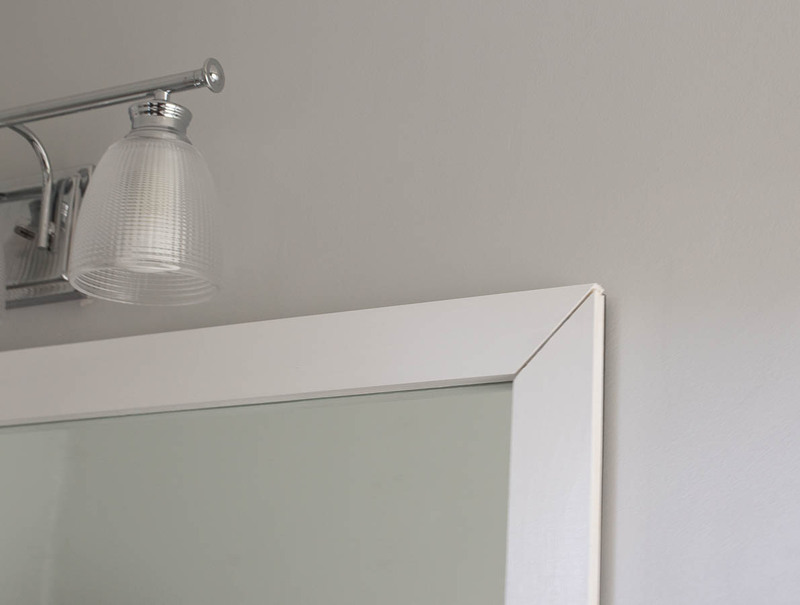 Here’s a quick tutorial on how to frame a builder grade bathroom mirror. The first step is to measure your vanity mirror length and width. Using your miter saw, cut your wood at a 45-degree angle so the outside portion of your wood piece will be the full length of the mirror (see pic above). Make cuts for all four sides. Next, sand the wood so it’s nice and smooth, be sure not to sand the angled cuts too much – you want them to fit together flush. Then, paint all the boards white. Matt also used the Dremel to notch out a chunk of wood where the mirror clips are (see image above) so that the frame would be flush against the mirror. Then, we layered out some Liquid Nails all over the back side of the board being careful not to get too close to the edge because you don’t want any of the adhesive to be visible in the reflection or to ooze out of the side. Immediately, place the board on the mirror. The outer edge of the frame will be at the edge of the mirror. We put our mirror together like this: top first, left side, bottom, then right side. When putting in the last piece it should fit like a puzzle, nice and tight. Now you’ll notice there is a small gap where the frame meets in this mitered corner. That’s totally okay! We filled that gap in the next step. 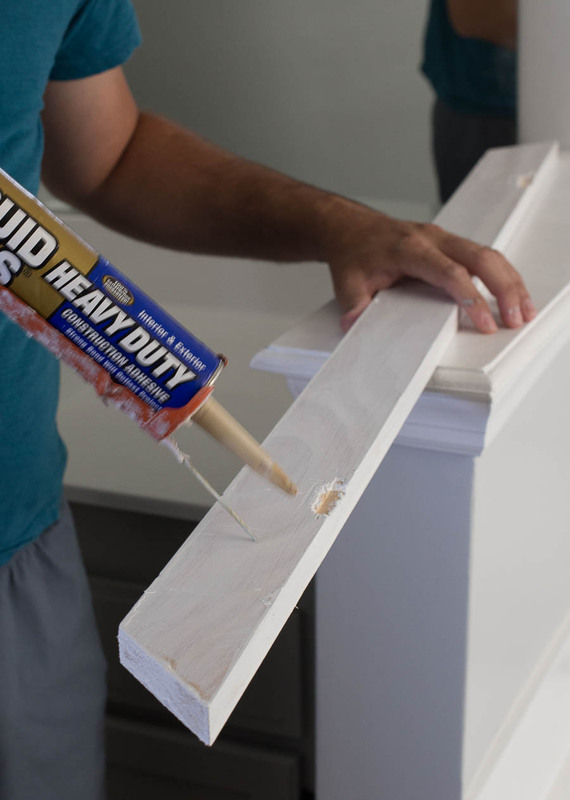 Using a caulk gun, add a layer of caulk to fill the gap. Matt smoothed the caulk out with his finger, and then wiped off the excess with a paper towel. Here’s the gap filled. After it dries you can paint over the caulk for a seamless look. That’s it! That’s how we framed out our bathroom mirror. It’s really an easy DIY project that can easily elevate your bathroom without a lot of money or a lot of effort. 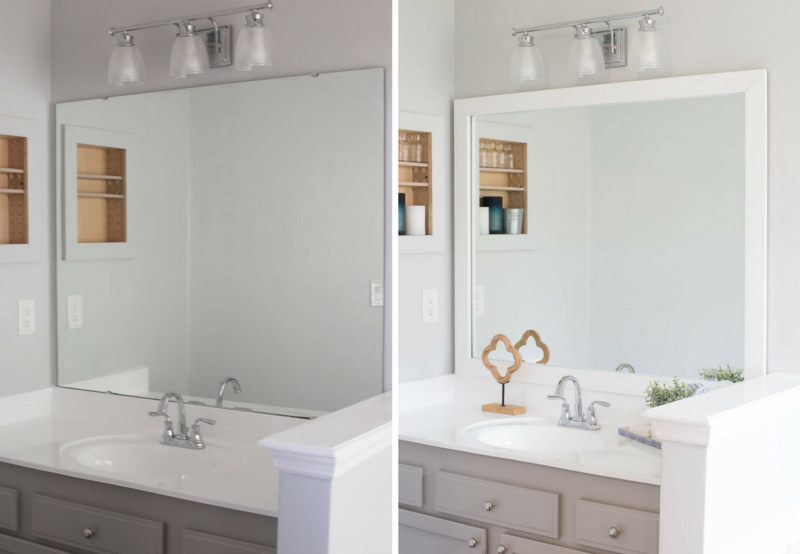 The mirrors look wonderful – and it would’ve been a shame if you had to replace them and lose all of that gorgeous mirror space. I’ve not done any decor, DIY projects lately. ? But this does remind me that I need to get my mirror for above my dresser hung…now to find the studs. ? I did this using windowsw frame moldingng and just did straight cuts. I glued the wood together and let set. I attached to the mirror using Velcro. This way if I want to repaint it later on it comes right off! This is a great tutorial. I love the idea of updating the existing mirror instead of replacing the entire thing. So much more cost effective! 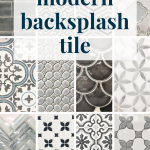 Thanks for the tips- we are hopefully going to be putting them to use in a few weeks on our guest bathroom! Hi there, this is great! I have been looking to do the exact same thing with some leftover 1×3’s laying around. Question though; are there any concerns with just gluing the wood to the mirror? What is a strong enough adhesive to feel safe that it will not fall? Thank you so much. We used liquid nails and it works like a charm. I love this idea. 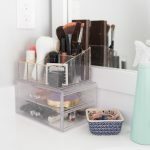 I am looking to redo my powder room and have a large mirror that I don’t want to take down. So this is a perfect solution of what I need. Although I won’t do myself, it will be a suggestion to the person doing my bathroom remodeling. Thank you. What color paint do you have on your cabinets? Hi. Looks great! One question, what did you do about the gap between the new frame and the wall? Hi Ann, we actually didn’t do anything with the gap because it is really not noticeable. You could add some small trim pieces if it’s is noticeable. This looks amazing! 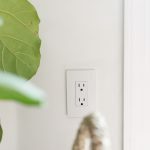 I am excited to try it in my own home. 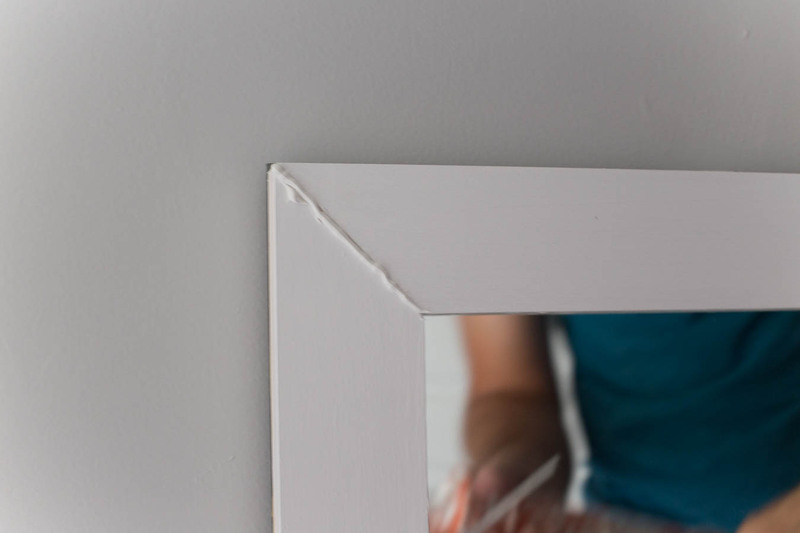 Quick question, did you glue the wood frame right onto the mirror, or is it glued to the wall? 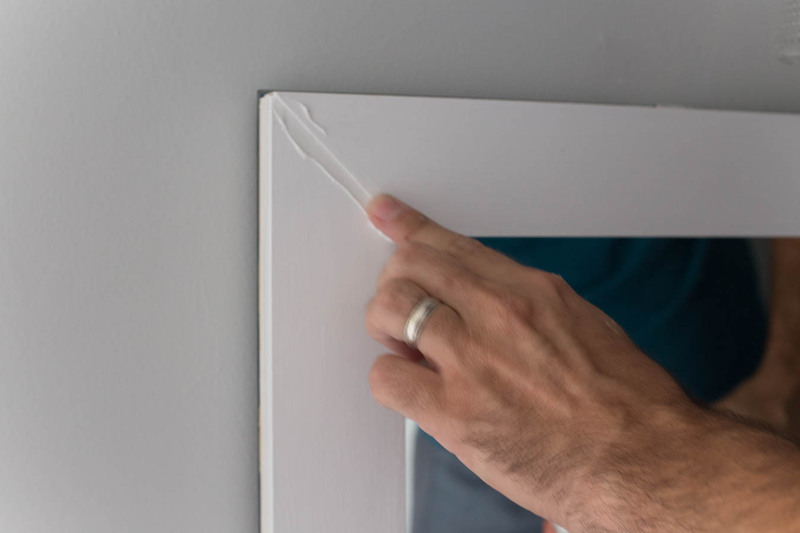 Hi Emma, the wood frame is glued directly to the mirror – that way it doesn’t damage the drywall if we ever want to swap them out. Great tutorial can’t wait to do this project on our plan mirror. Do you know what color paint you have on your cabinets? Question! 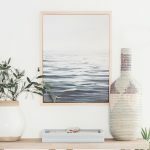 How would you go about removing the mirror from the wall if needed? 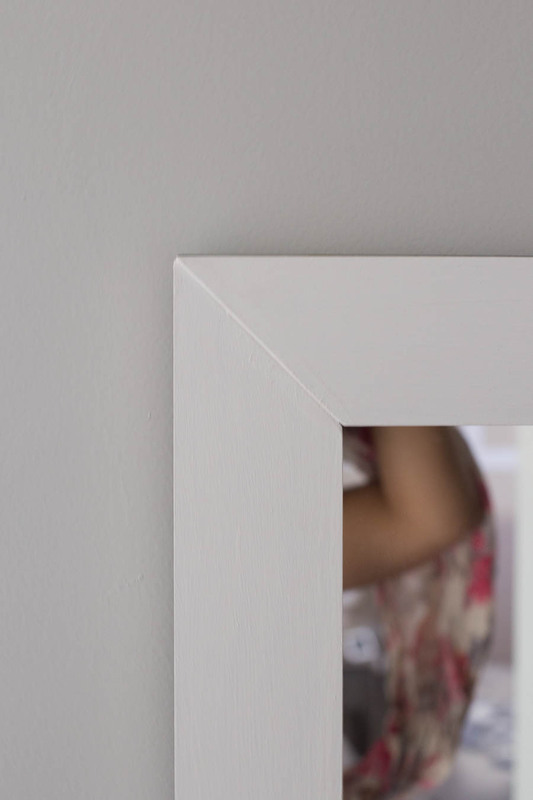 I’m looking to do this on a smaller scale by framing a mirror I have to look like a window for some living room decor, but I don’t want to have to break the wood off the mirror if it’s glued over the clips like this. Any ideas? Hey Megan, You’d probably just have to pry the whole thing off the wall and it’s likely the wood/mirror would be damaged in the process. This is a good fix to quickly updating a builder grade option. If you want to replace you’re likely not going to be able to reuse the mirror. Sorry! 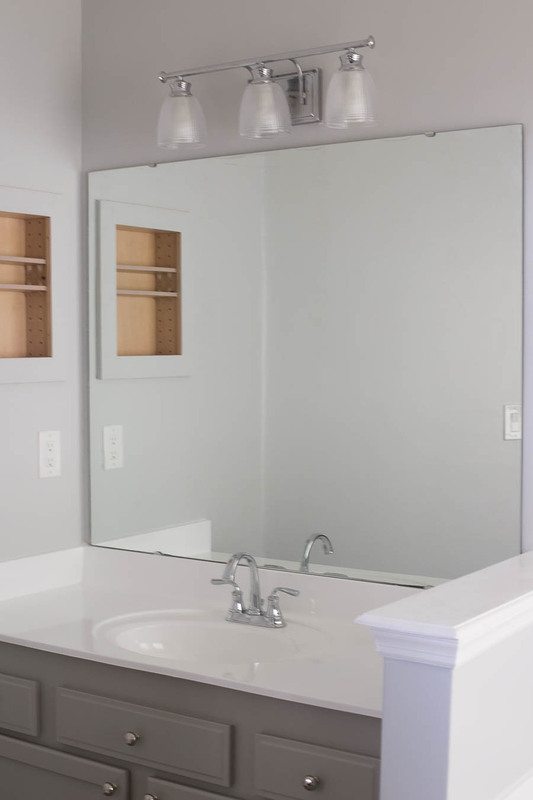 Can you use wood molding from Lowes to frame around the mirror to give it more of a design? What is the thickness of the wood you used to make the frame? Love the look!! I am finally getting around to framing my very large master bath mirror. I want to chalk paint and distress. Do you think I would then need to seal or wax? Hi Jenn, yes I would wax.